Whole Life-Cycle Activated Mushrooms health. Immunity™ delivers mushrooms’ whole protective shield by combining mycelium, fruiting bodies, spores, and their extracellular compounds. 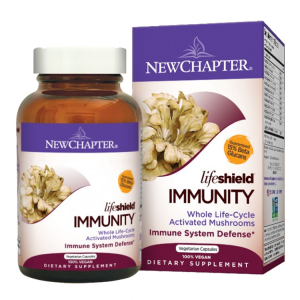 Full-spectrum mushrooms guarantee minimum 15% beta-glucans for optimal potency and benefit. Directions: As a dietary supplement, take two Vcaps daily. Can be taken anytime, even on an empty stomach. Other ingredients: Modified cellulose (capsule) and organic & biodynamic myceliated brown rice. 100% vegan; no artificial flavors or colors.